Carl Celian Icahn (born February 16, 1936) is an American businessman, investor, and philanthropist. He is the founder and controlling shareholder of Icahn Enterprises, a diversified conglomerate holding company based in New York City, formerly known as American Real Estate Partners. He is also Chairman of Federal-Mogul, an American developer, manufacturer and supplier of powertrain components and vehicle safety products. 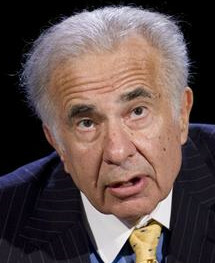 In the 1980s Icahn developed a reputation as a "corporate raider" after profiting from the hostile takeover and asset stripping of the American airline TWA. According to Forbes Magazine, Icahn had a net worth of $16.6 billion in 2017, making him the 26th-wealthiest person on the Forbes 400, and the 5th wealthiest hedge fund manager. Icahn served as special economic adviser on financial regulation to US President Donald Trump briefly in 2017, leaving amid concerns of conflicts of interest. Will Carl Icahn Win His Bet On Hertz As Well? There are too many exotic, leveraged products and one day these securities are going to blow up the market, Carl Icahn tells CNBC. The billionaire investor says, "The market itself is way over-leveraged," and at some point could "implode." But for now, he believes, "This thing will probably bounce back. ".